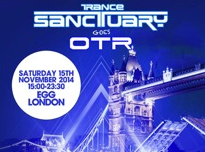 After a big September party which saw trance DJs Signum and Menno de Jong joined by Will Atkinson, Mateusz and Stephen Kirkwood, Trance Sanctuary looks forward to the next event where it joins forces with Sheffield trance night OTR (Off The Rails) to bring another big line up. 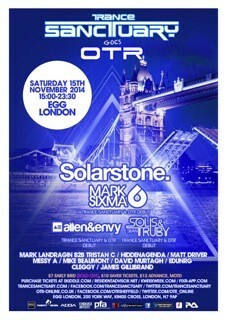 Taking place at The Egg in London, the night welcomes Solarstone, possibly one of the world’s leading trance producer/DJs. Joining him will be Allen & Envy, two new talents producing melodic and uplifting trance, and trance duo Solis & Sean Truby who have recently been making huge progress with their Infransonic Recordings label. Headlining the BangMessy room will be Dutchman Mark Sixma, a producer of big room trance, who recently had the honour of simultaneously holding the #1 and #2 spots in the Beatport trance charts.